The good: The fact that I could feel sympathy and understanding for a bunch of entitled 15 year olds so different myself (now and then) shows the strength of the author's writing. Lexi is beautiful. It's something she's heard her entire life, from family, friends and strangers. It's a fact and if she's honest with herself, it's also her defining quality. So when a car accident leaves half her face scarred - where does that leave her? This story is a girl's struggle to grow up and define herself on her own terms. Lexi is very much a teenager. She's dependent on her looks, bratty, self-absorbed (pre and post accident) and frustrating to the point where you want to shake some sense into her (ditto for her best friend - seriously, teens these days!). And yet.. I saw something in her, underneath all her drama. She's a good person struggling to accept herself and find her place among the people in her life. Plus if I was thrown out a car and scarred half my face - I would think it was the end of the world too. And if I was a teenager when that happened, I would feel the same way times a billion. I thought the book did amazing job of capturing that. It's not supposed to be an easy journey. It's meant to be frustrating. Along the way, Lexi learns some necessary truths about friendship (I'm still on the fence about her BFF but jealousy can make people do stupid things), her sister (who I think is awesome), guys (she finds a little romance), and herself. (Minor) reservations: I hoped the book would explore Levi's relationship with her mom more. This woman had been monitoring her food and looks intensely her whole life but it was never fully explained. I mean with the way she treated her, she's lucky Lexi wasn't anorexic or bulimic. Her mom obviously plays a huge role in her life but she felt so one dimensional. She didn't seem to understand anything Lexi told her. There were also some other threads I wanted better resolved but maybe things were meant to be open-ended. Do I recommend? : Yes! It was a quick read that was emotional and realistic. I really enjoyed it! Yeah, if half my face was scarred I would think it was the end of the world too. 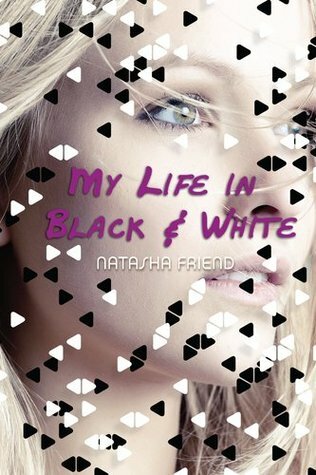 Glad to hear this is a quick, emotional read because I have My Life In Black And White on my TBR! Seriously! It was really interesting to see how she dealt with it or didn't deal with it rather. I thought it was realistic portrayal of how a young teenager would feel. Hope you like it! Is it sad that I want to read this because the character is named Lexi? LOL. Other than that, it does sound pretty darn good to me.